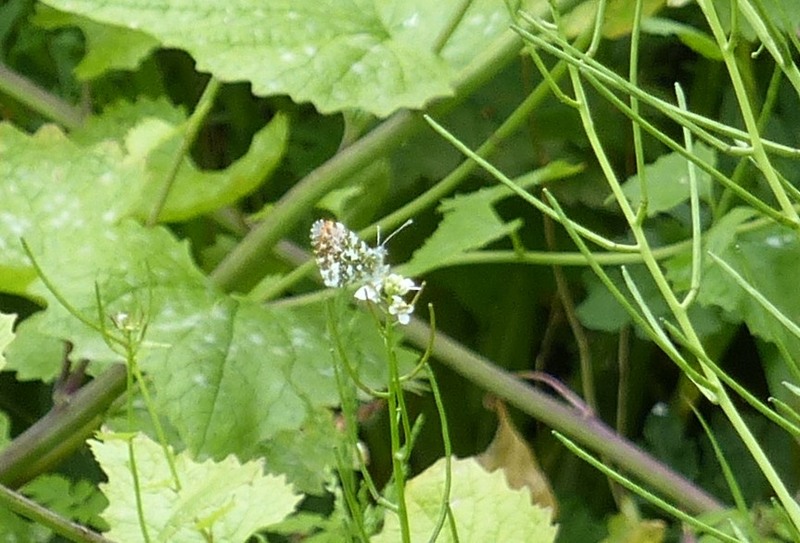 Naturalists from North America will recognize this plant, the maligned, non-native garlic mustard (Alliaria petiolata). I photographed this one in South Queensferry, Scotland. Recognition is likely not the only response to the sight of these leaves and flowers. Hands and elbows may start twitching in anticipation of the pleasure of uprooting the plant. This tugging reflex is organized into gatherings called “pulls” where people mass to yank swaths of the plant from the soil, bag the plants, then consign them to the landfill or fire. Depart from me, you who are cursed, into the eternal fire prepared for the devil and his angels. This vigorous dislike has a good ecological foundation. The plant invades woodlands and smothers native plants, reducing botanical diversity. Chemical weapons are used in this process: garlic mustard releases chemicals into the soil that sap the vitality of surrounding plants. These chemicals act by suppressing the germination and growth of mycorrhizal fungi whose mutualistic relationship with plant roots helps many forest plants to grow successfully. In the UK, where garlic mustard is native, the species is known as Jack-in-the-hedge and is fairly common in damp hedgerows and field edges. Unlike their American counterparts, local naturalists esteem the plant for its role as the host plant for caterpillars of several native butterflies. The orange-tip (Anthocharis cardamines) is the most well-known of these. This conspicuous white butterfly with bright orange wing tips often loiters in patches of Jack-in-the-hedge. The green-veined white (Pieris napi) is another species that uses the plant as a primary host for its caterpillars. The small white (Pieris rapae) — sometimes known as the “cabbage white” — will lay its eggs on Jack-in-the-hedge when it can’t find a gardener’s cabbage or broccoli. In North American, the plant’s relationship with butterflies is not so nurturing. The West Virginia white butterfly (Pieris virginiensis) normally lays its eggs on native toothwort (Dentaria), but the female butterflies are also attracted to garlic mustard. Unfortunately for the caterpillars of these fooled females, the novel chemical mixture in garlic mustard prevents the youngsters from growing. The plant is therefore an ecological trap: drawing in butterflies with the promise of good food, then killing them. This confused tale has its origins in the close family ties among the species involved. Toothwort and garlic mustard both belong to the family Brassicaceae. North American butterflies are drawn to the presumably familiar scent of the import. But family resemblance only goes so far. American butterflies have not evolved the particularities of biochemical detoxification needed to feed on garlic mustard, whereas their European kin in the same subfamily of butterflies (Pierinae) have mastered these mechanisms. Whether evolution will be fast enough to allow the Americans to adapt remains to be seen. It doesn’t help that butterflies in Bible Belt states are kept in the dark about natural selection, giving the missionary mustards a boost in their colonial quest. Orange-tip butterfly, male, on Jack-in-the-hedge. South Queensferry, Scotland. 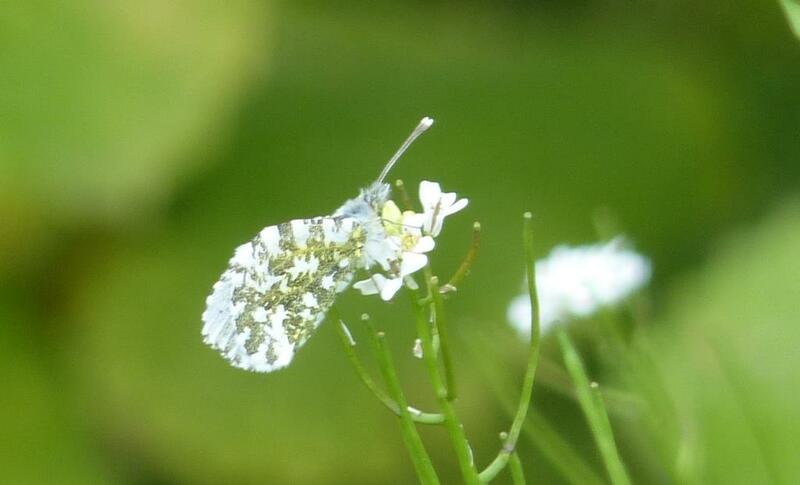 Orange-tip butterfly, female. South Queensferry, Scotland. 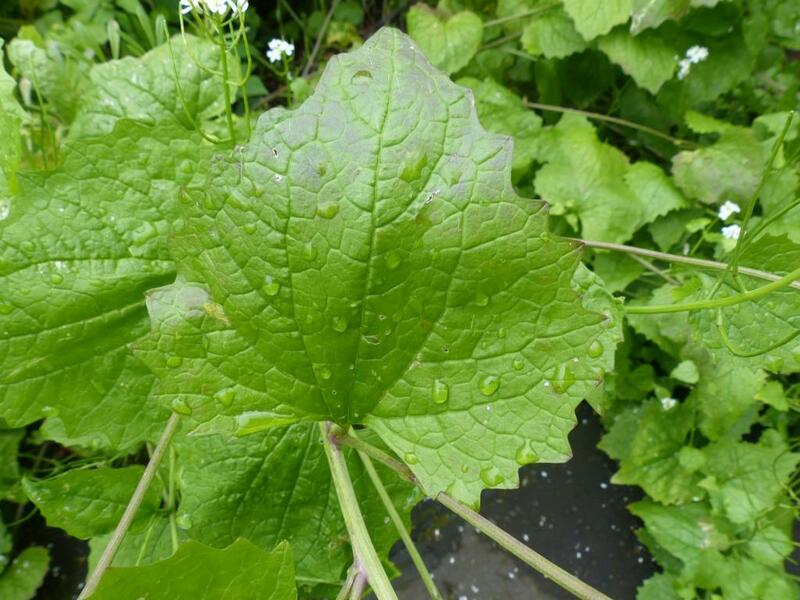 This entry was posted in Butterflies, Travels and tagged garlic mustard, Scotland, South Queensferry on June 5, 2014 by David George Haskell. Thank you. I’ll look into fixing the link. I’m glad you find the connections to the literature helpful. Thank you for these links. I’m sorry that the plant has spread so extensively. This species occupies habitat for Braun’s rockcress (Boechera perstellata), a federally listed endangered species. 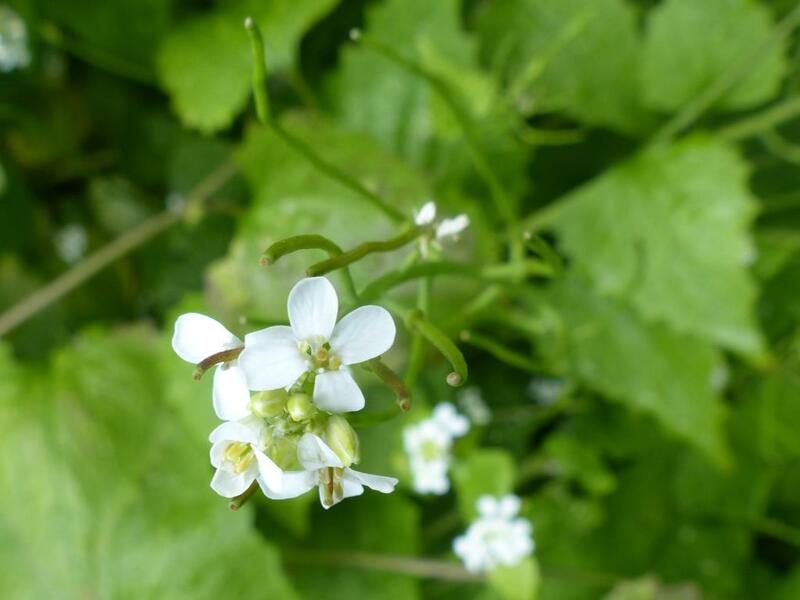 At historical sites in the central basin of Tennessee where the rockcress was seen, garlic mustard is abundant and grows precisely in the sites that the rockcress would prefer. The evidence is circumstantial but it appears that this species and other invasive plants have pushed a rare species further towards the edge. Fortunately, but not frequently, we are still finding new populations of the rockcress away from populated areas and the resultant mix of invasive plants. The TAG group appears to have a bunch of chemical company representatives on it which explains why it continues to block the introduction of monophagous weevil C. scrobicollis. There doesn’t seem to be any other credible explanation for the endless stonewalling. People were talking about it being likely to be approved for introduction in 2002, for goodness’ sake.